"Oh, Dakuwaqa!" 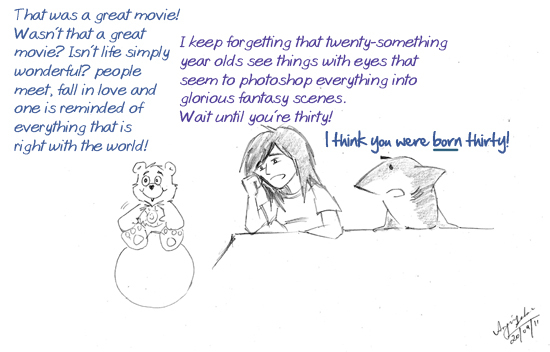 - The Shark comics and cartoons: Born Thirty. Not free. I think I was born 30. This was from an actual conversation that I had with someone. It's not fun being torn between wanting to sigh and wanting to roll your eyes at romantic comedies. The problem is that even though we know that some of these movies are so ridiculously unreal, we wouldn't enjoy it half as much if they had much reality in them. And the problem with fantasy is that if it ever really happened we'd just be incredulous about it. Being jaded and in denial is not a great combination but I think sometimes those heart traits show up when you least want them to.